1 - 2 $4.95 ea. 3 - 10 $4.45 ea. Could be lilliputian versions of Heidi Klum and Naomi Campbell, but they’re not. 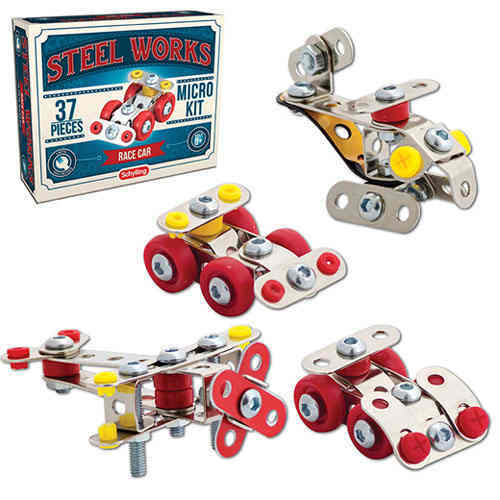 They’re dandy little 37-piece (mostly) steel model kits of two different racers, a biplane or a helicopter, from Steel Works. Finished models will be a couple of inches long, and a tiny tool for assembly is included. We’ll pick one that will be just right for you. Ages 8+. Shoot one of these little plastic arrow-helicopter-rotor gismos straight up with the included rubber band launcher and watch it soar as far as 300 feet! 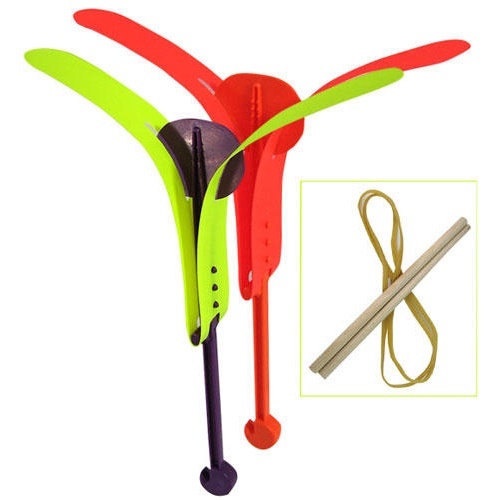 A fun outdoor toy that grows in sophistication as you learn how to adjust the arrowcopter for wind conditions and flight patterns: distance, return, circular descent etc. Our "each" contains a package of two (2). Recommended for kids over the age of 9. Wooden You Rather Use Wood? 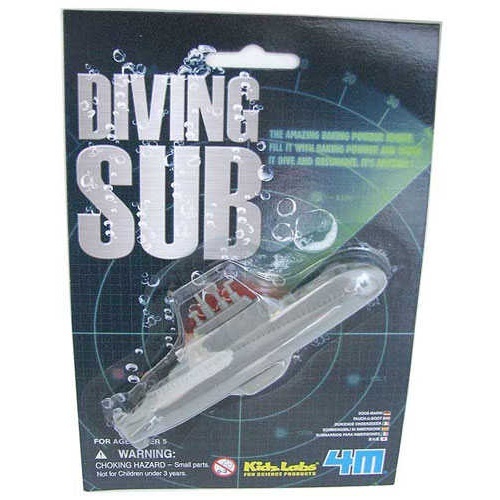 Back in the days when technology was a good guy, and cereal boxes came with real toys, kids got diving submarines that they charged with baking powder and played with in the bath tub. Now kids can have the same fun again. We have found a (gray!) 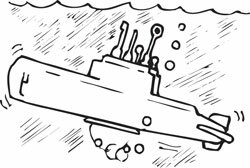 submarine, about 4-1/2" long, that can dive and surface up to a dozen times with a single charge of the baking powder that you get to supply. Comes with instructions and made in the USA. 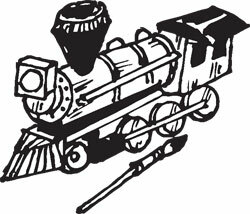 The problem with mobiles is that you have to wait to inherit the wind before they do anything interesting. Until now. 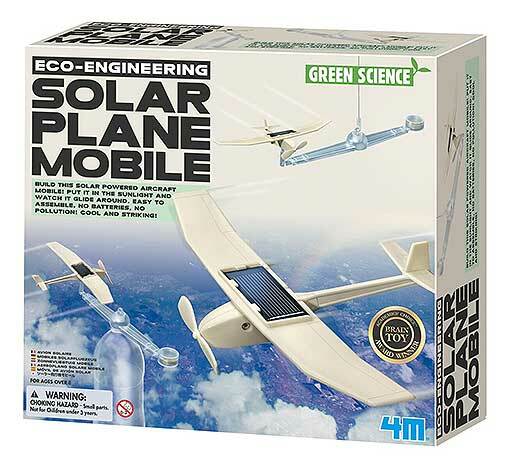 This devilishly clever mobile has an 8” wide single prop plane with a solar cell up top mounted on a crossbar with a coin holder at the opposite end for ballast. The whole shebang is approx 18” long. Can be hung on the included 5” ball chain or set on top of an empty plastic pop bottle. In white plastic, which you could paint if you tend to paint things. 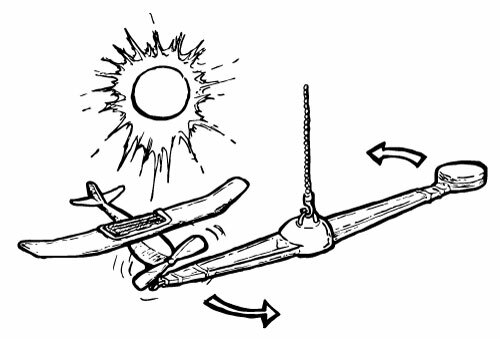 Design your own planes, then fly 'em. 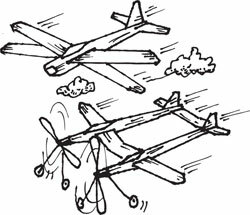 This kit has (35) parts including balsa wings and bodies, plastic struts and landing gears, rubber-band drives and (3) props. 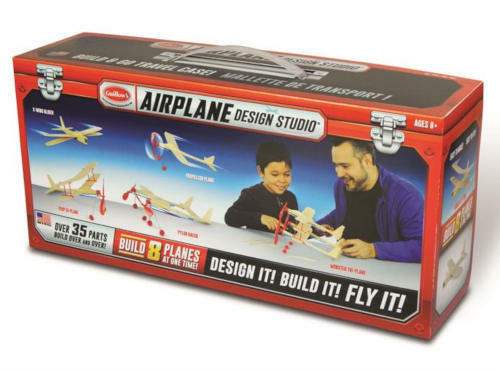 Comes with instructions for (4) planes, including an X-wing and tri-plane, but it's made for you to experiment with your own designs. Also made to build, disassemble and rebuild different models. For ages 8+. 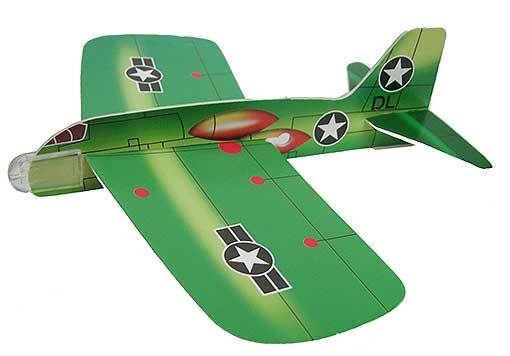 Balsa-wood salesmen are probably fighting Styrofoam constantly, but in this case we’re talking full-color, Styrofoam glider models of a whole bunch of classic fighter planes. All good fliers, with 7-1/2” wingspans and nose guards. 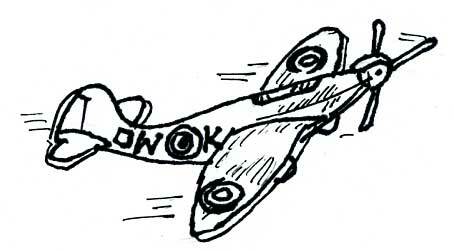 You’ll get (4) from a squadron that includes Lockheed C-130E Hercules, Mitsubishi Zero, Grumman F6F Hellcat, Spitfire MKI and scads of other vintage birds. Great birthday party treats. 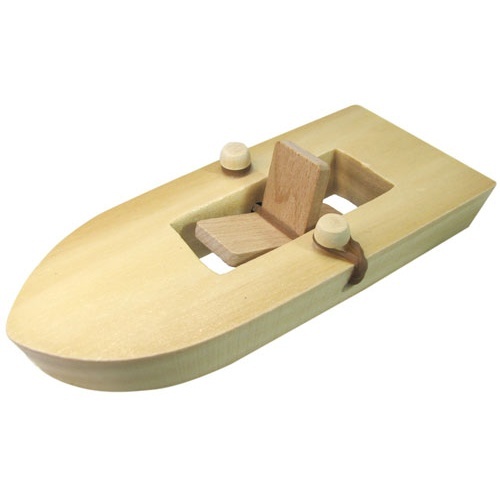 It's kinda pretty, and pretty simple, this old-fashioned rubber band-powered boat. 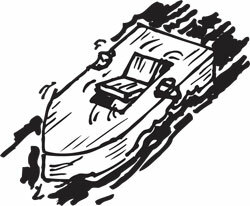 Wind the paddle, watch it ride the waves, or bathtub. 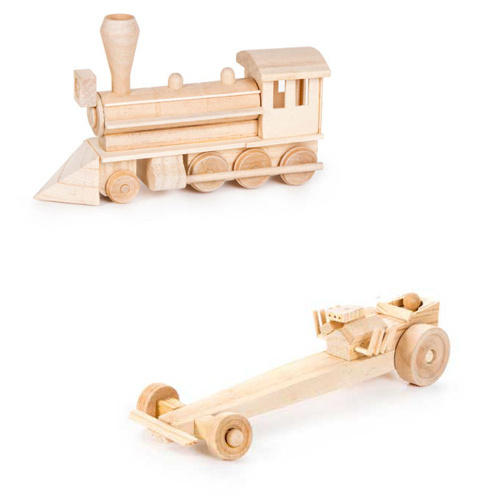 Measures 5-3/4" x 2-1/2"x 11/16" in varnished pine and even comes with spare rubber bands. 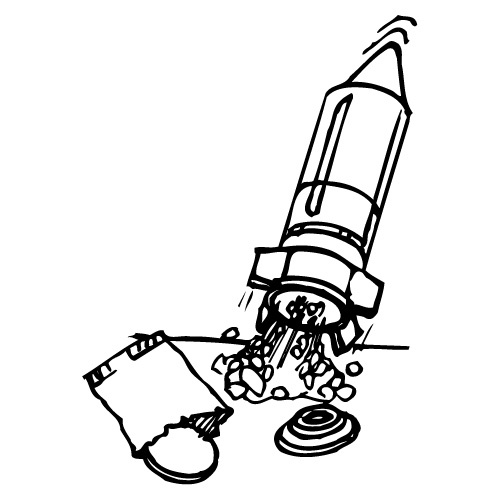 Incendiary rocket fuel? We don't need no stinkin' incendiary rocket fuel. We got the Mighty Seltzer Rocket! The seltzer rocket, made of simple plastic parts. (No, don't lean over it!. That's not a foam nose cone, you know!) 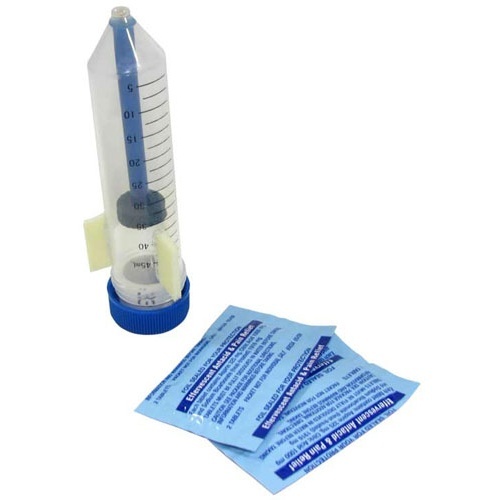 The 4-1/4" x 1-1/4" dia seltzer rocket that holds water and (1) dissolving seltzer tablet. The rocket that has shot almost 30 feet in the air for us. It comes with (4) antacid tablets, just like those you can buy at the drug store -- and it's basic science at its best! 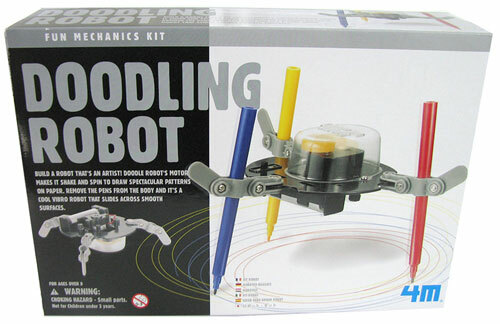 All the hip kids have them because who wants to have to make their own fun when they could make a robot to have fun for them. 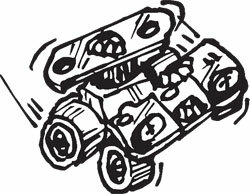 You pick: the Doodling Robot saves you from having to draw stuff on your notebook during meetings. Includes red, blue and yellow markers to mount on (3) adjustable arms on a 3-3/4” base with a DC motor powered by a “AA” battery you provide. 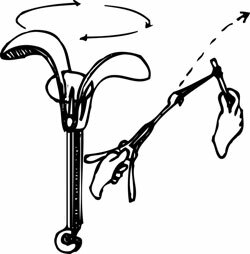 Spins and shakes to doodle better than you ever did, and includes arm extensions to vary the patterns. 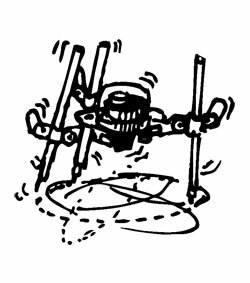 Or: the Table Top Robot crab that’s smart enough not to fall off the table. Measures approx 2” tall x 3-3/8” counting its claws x 6-5/8” counting its (8) legs. You add a “AA” battery. Both are easy to assemble. 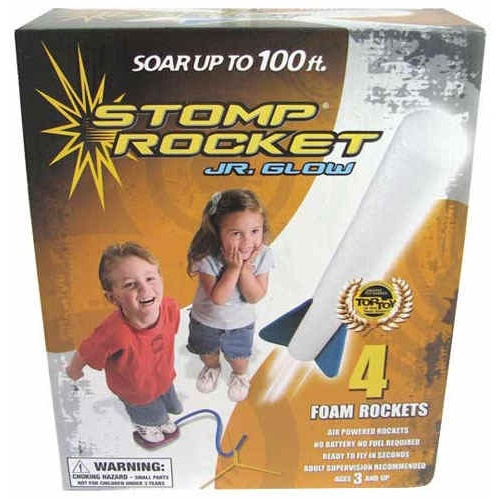 Just like the original Stomp® Rocket but slightly smaller for slightly smaller feet, the Stomp® Rocket Jr. Glow also, you guessed it, glows in the dark. 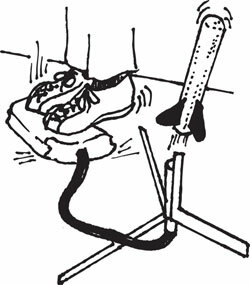 Includes (4) 8-3/4" tall foam rockets, launch tripod, 3-foot hose and the launching pad on which you or your young 'uns stomp to launch it up to 100 feet. Runs on air alone (no more waiting for your liquid hydrogen order from NASA) so it's safe. For ages 3 and up, depending upon shoe size.